These are the best Pakoras (aka potato fritters) you will ever eat. Yup, I am making that claim because they are, quite simply, the best I’ve ever had in the twin cities, either home or professionally made. They are so good, that I’m actually a wee bit hesitant to share this recipe, because that means relinquishing the title of best pakora maker. However, I am making this sacrifice for the greater good. The world needs more of these awesome Pakistani pakoras. There are way too many bland, tasteless pakoras out there. NO MORE. I say. So, for the uninitiated in pakora eating, here is what defines the IDEAL Pakistani pakora. First, the texture. The perfect pakora is slightly puffy but crispy. None of this soft, puffy, over inflated deals you get when you put in too much baking soda. Nuh uh. But, mind you, it’s also NOT flat. This is a pakora, not a besan chip. There MUST be a difference between the two. It has to be spicy, and a bit tart, the perfect blend of the two, but without taking it overboard—be nice to your tummies please. The color has to be the perfect golden brown. Not YELLOW and undercooked and not BROWN and overcooked. This is the part where your frying technique will really come into play. My recipe can only take you so far, young grasshopper. It is up to you to master the art of timing the frying so that it is just right. If you remove the pakoras too early OR too late, the flavor will NOT reach its optimal potential. I’ll try to break it down for you in the notes as best as I can, but this will vary based on where you live, the kind of oil you’re using, etc. Just keep practicing, it is TOTALLY worth it. And now I’m distracted…what was I saying? 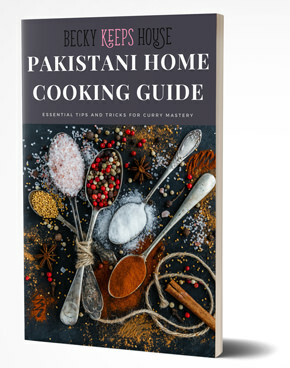 There are a few things to keep in mind when using my Pakistani Pakora recipe. First, make sure your besan is fresh! If the texture and taste of your pakoras isn’t coming out right, 9 times out of 10, it’s due to bad besan. Second, the order of the ingredients is very important. 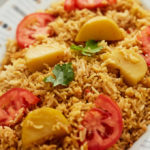 Try to add your ingredients as I describe in the recipe. Now, if you want your Pakistani pakora nice and crispy, then use 3/4 cup water for 1 cup of besan (gram flour). I don’t have a measuring spoon small enough to accurately measure how much baking soda I use for a crispy batch, but it’s more than 1/16 of a tsp and less than 1/8 of a tsp. If you like them puffy (why?) then use only 1/2 cup + 3 tbsp water and about 1/8 tsp of baking soda. 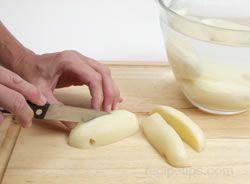 Please note that, after making the batter, if you wait too long to fry these, the onions will start to release their water, making the batter runnier. If this happens, just mix more besan into the batter until you get back to the original consistency. You need to have plenty of oil in your wok (karhai) in order for these to expand. If you are stingy with the oil, they will be flat and tough. 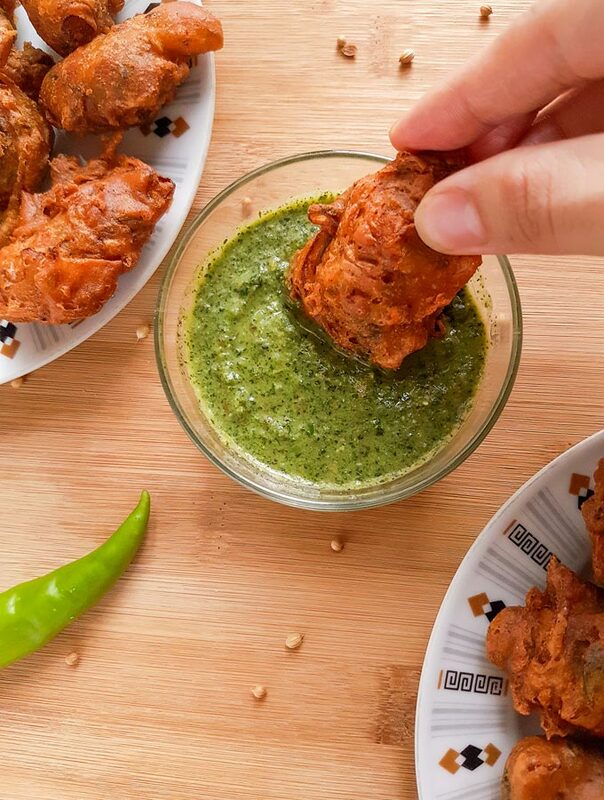 I know that everyone has a pakora recipe that they love, but I really hope you try this one at least once. I honestly think you’re going to love it as much as I do. And if you’re planning these for tea time and really want to give your tastebuds a treat, you should totally add my Chilli Cheese Toast with Garlic and Olives to the menu. It’s quick and delicious and you’ll thank me later. If you love these as much as I hope you will, please check out my Chicken Pakora recipe. Now go forth, my students! Be bold! Be brave! And remember: Never under-fry your Pakistani Pakoras! 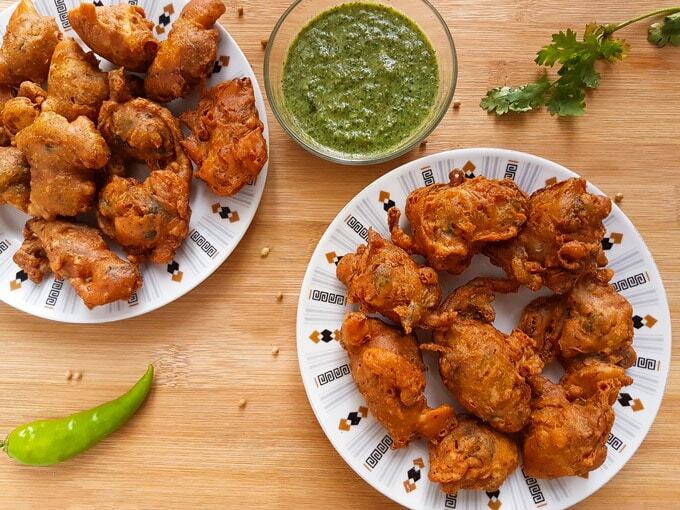 This Pakistani pakora recipe makes crunchy, spicy, buttery delicious pakoras (potato fritters). The best you've ever eaten, guaranteed! Pour the oil in your deep fryer/wok and heat on low flame. Chop the onion, potato, green chili and green coriander and combine in a mixing bowl. Add the cumin, crushed red chili, coriander seeds, khatai powder, baking soda, corn flour, salt and gram flour. Mix together. Slowly add in the water and mix. Increase heat to medium flame. Use a tablespoon to put tablespoonfuls of batter into the oil. Fry until golden brown and crispy, turning as needed to cook evenly. The order that you put the ingredients in is very important. Follow the steps in the recipe exactly to get the desired result. Water amounts may vary based on your gram flour. Start with my measurement and increase water or add in more gram flour if necessary. Very quick chutney: Combine equal parts green coriander and green chili, a clove of garlic, a pinch of salt and yogurt (as desired to thin out the chutney). Blend to desired consistency. If too watery, chill in the fridge to firm up before serving. 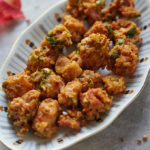 Oh, I am so glad that you did not give up, this is a delicious recipe and I love pakoras. I have made it with eggplant / aubregine, but not potatoes. 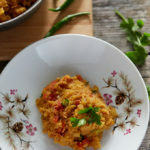 I would looove to try out this recipe…but I need to make sure that the besan is okay first! Haha! Yes! Fresh besan is key! 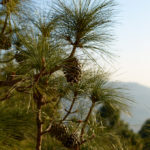 I hope you get a chance to try it and like it. Eggplant pakoras are a favorite of mine, as well. Then again, I love eggplant EVERYTHING! 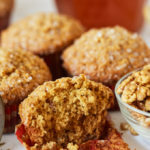 I tried this recipe and loved it!! The ratios were perfect and I loved the addition of amchur powder! 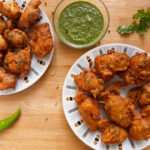 This will be my go-to pakora recipe. Thank you, Becky! You. Are. The. Best. Thank you ever so much. This recipe was amazingly proportioned and real easy on the tongue. You really helped me impress my family. Thank you, once more. I’m so glad I could help! Comments like this totally make my day, so thank YOU for your kind feedback! Can u explain how are the onions cut? Sorry I meant the potatoes. Sure thing! 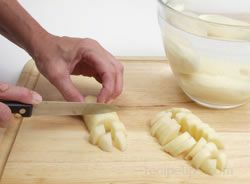 Cut the potato in half the long way, meaning cut so that you have two long halves of the potato, then cut each of those long halves in half again so that you have 4 long quarters (like this). Then slice those quarters sorta like this but I cut mine even thinner. As a Pakistani missing my mums pakoras I am so glad I found this recipe. It is utterly perfect! I am so glad to hear that! Thank you so much!